5/17/03 - They're off! Despite a delayed start, Stephen and Sam left Acton, MA towards New Paltz, NY (Heather's house). 5/19/03 - Reports of Sam being locked out are now confirmed ... Stephen and Sam drove south to Emma's house in Roanoke, VA, 560 miles, 10 hours, everything A-OK.
5/20/03 - Stephen and Sam visited Jefferson National Forest near Roanoke, VA, with their most gracious host Emma. Tomorrow our young adventurers plan on heading to Mammoth Caves, KY. The Big Decision is coming --- do they take US 40 through Texas, New Mexico, Arizona or US 70 through Kansas and Colorado? We'll find out when you do! 5/21/03 - Camping in the caves? No - in a campsite on the Mammoth Caves National Park! Today was spent driving, driving, driving.... Arrived at the campsite around 6 PM to enjoy a home-cooked meal of Annies and hot-dogs! (his mother is sooo proud!) Looks like its going to be the Southern Route for the boys. Plans for tomorrow include a trip through Mammoth Caves in the morning and then they plan to drive southwest on US 40 to the Hot Springs National Park. 5/22/03 - Our young adventurers awoke today at 7:00 AM ... but (as luck would have it) Mammoth Caves didn't open until 11:00 AM ... so (keeping their priorities straight) it was off to drive across Arkansas and Oklahoma instead of exploring one of the world's greatest caves! Stephen called from a pay phone 40 miles east of the Oklahoma/Arkansas state line and they plan to spend the night in Arrowhead State Park in Oklahoma. Even Hot Springs was bypassed on the journey west. 5/23/03 - Plans are made just to be broken. Stephen and Sam called from Santa Rosa, NM, east of Albuquerque on US 40,and plan to stop for the night in Villaneuva State Park. Last night they ended up staying at Fountainhead State Park in Checotah, Oklahoma. No definite plans for tomorrow except, "Go West young man, go West!" 5/24/03 - WalMart ... you either love it or hate it. Stephen's ATM card got locked out when the WalMart ATM near Santa Fe, NM would only take 4 characters for the PIN. Do this three times and ... well you know what happens ... no ATM card for 24 hours! Our young travelers called us at the Hotel Belvedere in NYC and reported their latest news. The plan is to head north to San Juan, CO, near Durango, for the night. We thought of them as we gazed at the Canyons of Manhattan ... but NYC is certainly not as scenic nor beautiful as New Mexico or Colorado. (Pauline denies that any scene in NYC could be called a canyon ... not even Times Square.) Alex wishes he were with them, maybe an invitation for the trip back? 5/25/03 - "Awesome!" That how Sam described Mesa Verde. Stephen and Sam slept a little late on Sunday and then spent the day at Mesa Verde National Park. Tonight they were headed back for a second night of camping at the San Juan National Forest after a big dinner at Applebee's (obviously the debit card is working again). Plans for tomorrow were still sketchy, but the boys hope to head southward to US 40 and then across New Mexico and Arizona towards California. 5/26/03 - Stephen called on US 40 south of Las Vegas, Nevada on the trip westward. Over 600 miles so far today! The goal for tonight was camping in or near Death Valley. San Francisco tomorrow? California Here They Come! 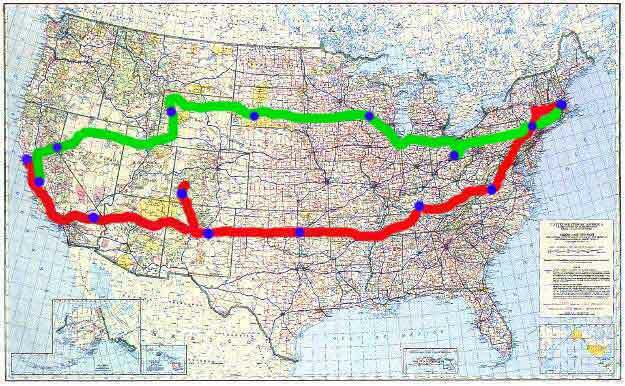 5/27/03 - After 400 miles of driving, our young travelers reported in from Monterey, CA. The weather was reported to be perfect (of course) and this was Sam's first view of the Pacific Ocean. Sam did all the driving today north on California Highway 1. They hope to make it to Santa Clara tonight and stay at Elizabeth's place. Coast to coast in only 9 days! 5/28/03 - The boys made it safely to Santa Clara and visited with Liz. The plans were sketchy, but included visiting San Francisco and the sites. Alex has his bags all packed and is heading on a an America West flight to San Jose via Phoenix. 5/29/03 - Alex flew out to California today and joined Stephen and Sam in San Jose, CA. The boys met up with Stephen's friend Liz and her boyfriend for a dinner of Thai noodles and then were reported seeking a camping spot near Santa Cruz to rest their weary heads. The plan for tomorrow is to say "Adios!" to California and start the journey eastward through Utah. 5/30/03 - Stephen and Alex called at 5:50 PDT 30 miles west of Reno, NV on US 80, in the Tahoe National Forest. Alex reported that weather was warm, sunny, and in the 80's --- very nice. Last night they stayed at a campground somewhere south of Santa Cruz and tonight they hope to camp somewhere east of Reno. Stephen reported that they were having Annie's Mac and Cheese again tonight. Yummmm! The boys might stop in Reno tonight to check out the nightlife ... too young for gambling, but it'll be interesting to hear Alex's observations. 5/31/03 - The boys called from somewhere in Utah, near the salt flats. They ended up camping Friday night in California rather than Nevada. Alex reported that they drove by some casinos in western Nevada, but there's no time to stop. Today they plan on driving all the way to Jackson, Wyoming (a very noble goal). Sam is having severe stomach troubles (so bad that they considered a stop at a local hospital for relief) ... could it be Stephen's fine camp cooking? Alex is having a great time with his older brother ... perhaps they'll take Ian next time? Let's hope Sam feels better ... perhaps a buffalo burger or two in Wyoming will help. 6/1/03 - Stephen, Alex, and Sam drove 880 miles all the way from Lake Tahoe, CA to the Grand Teton National Park in Wyoming ... a very long 15 hours of driving! The weather is much cooler than California, in the 40's and 50's and very cool tonight (Alex is wearing his sweater). They slept in a bit today after the long drive and hiked in the Tetons up towards Amphitheater Lake. Alex reported that the trail was covered in snow. Sam is feeling much better and dinner tonight was "Pasta in a Bag" (I only report the stories, not create them). They also took a short drive into Yellowstone National Park and plan to drive to Badlands National Park in South Dakota tomorrow. 6/2/03 - Stephen called at 7:30 MDT in from a small convenience store in Dayton, WY, along Route 14. The boys spent the day driving north from Grand Teton National Park and then through Yellowstone. Alex reported that it was cold the night before and that Sam didn't get much sleep due to a running nose and a developing cold. From the store the Bighorn Mountains rose around the town with clear skies. They still had not finalized their dinner plans, but something cooked along side US 90 as they traveled eastward towards South Dakota seemed in order (not road kill we hope). They still had over 200 miles of highway driving ahead of them tonight, Alex promising to stay awake with Stephen as they rambled along. 6/3/03 - The boys called from somewhere in Minnesota after another long day of driving. They did not stop and visit the world's largest ball of twine in Darwin, MN. They did eat another roadside lunch of PBJ's. Sam is reported on the mend after not visiting Mount Rushmore in Keystone, SD. Last night the boys drove until early in the morning (Alex stayed awake discussing the Meaning of Life with Stephen) to Badlands National Park. Tonight they hope to continue on US 90 and camp somewhere in eastern Minnesota near the Mississippi River. Another gourmet meal of Annie's Mac and Cheese is planned. Believe it or not, they hope to drive all the way from Minnesota, across Wisconsin, Illinois, and Indiana, and then spend the night in Wooster, Ohio tomorrow. 6/4/03 - No calls to a slightly nervous father today! But we can only guess that the boys had another very busy day today not visiting places on the drive towards the Atlantic Ocean. They did not visit the famous breweries of Milwaukee or Chicago's Sear's Tower but drove east towards the Ohio Valley. their goal was Wooster College where Sam goes to school. 6/5/03 - Stephen called (finally) from Heather's house in New Paltz, NY. Another long day of driving (Alex says too much), but they arrived in time to take Heather out to dinner at Bachus. Here folks are being tolerant and most gracious hosts to the tired travelers. Tomorrow the plan is to leave around Noon and head east on US 84, pick up the Mass Pike, and home to Acton in time for dinner. Stephen told a long and scary story about trying to find a place to camp in Wisconsin, something about deer on the road, heavy fog, 666 appearing on the odometer, mysterious lights, etc. We'll have to find out more when everyone's safe and sound at home. 6/6/03 - Back in Acton, Massachusetts?? ?